A snowstorm that swept into Massachusetts was expected to morph into a wintry mix Tuesday afternoon and night but not before dropping up to 8 inches in some areas. “Our latest mixed precipitation event currently underway is bringing widespread snow, changing to sleet, freezing rain, and rain across Southern New England,” the National Weather Service said at 4 p.m.
Cars slid and crashed, and there were traffic delays during the afternoon commute. Numerous schools across the state were closed or dismissed students early. Forecasters issued a winter storm warning for northern parts of the state and winter weather advisories elsewhere. A National Weather Service snowfall total projection map predicted as much as 8 inches of snow along the northern edge of the state, with smaller amounts to the south and east. Five inches were expected in Boston, and 1 to 3 inches on the Cape and Islands. 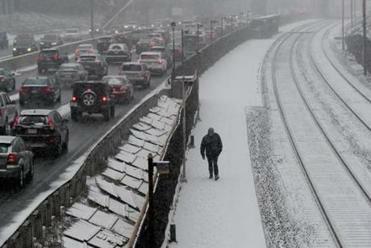 The forecasters said the snow was already changing over to sleet and freezing rain in southern Rhode Island, and the changeover would move north through the evening, arriving in the Boston area by 7 to 8 p.m.
From Brookline to Falmouth, a number of car crashes were reported in Massachusetts as the snowstorm continued. Shortly before 5 p.m., several inches of snow were reported in some areas, with higher amounts in Western and Central Massachusetts. The forecasters said heavy sleet could fall through the evening before changing to rain or freezing rain. Up to a quarter-inch of ice was expected to accumulate but not to cause widespread damage, the forecasters said. The good news is that most of the slushy precipitation is expected to leave the region by 7 a.m. And the slushy mix isn’t expected to freeze into concrete because temperatures are expected to rise into the 40s on a windy Wednesday. “We don’t expect a solid freeze behind this system like we saw [recently],” the forecasters said. On Thursday, the highs are expected to be a little cooler, in the high 30s to low 40s. But on Friday, it will be rainy and mild with some areas seeing highs in the low 50s, forecasters said.